Radiation Passport aims to fulfill an important need: to quantify the cancer risk for the various diagnostic imaging studies and to add up the cumulative exposure and cancer risk for one patient. The app makers explicitly invite lay persons to track their own cumulative dose (thus the monicker “passport”) but the design and vocabulary appear to be targeted more toward physicians. While the diagnostic benefits of modern imaging techniques are easily appreciated, the risk of exposure to ionizing radiation is less well understood. This question has become more acute as recently published studies attempting to quantify cancer risk from diagnostic radiation were widely picked up by media outlets. I can attest that, in recent months, many of my patients have brought up this coverage when I ordered scans. At the same time, I have also decreased orders for CT scans and even x-rays in my pediatric patients. Radiation Passport (iTunes link) was designed and built by a team of two brothers, one of whom is a radiologist – and is priced at $3.99. The application includes a well written “background” section which deals early-on with the vexing dilemma of calculating cancer risk – that much of of the data on cancer risk is extrapolated from atomic bomb data – by simply stating it is the best information available. 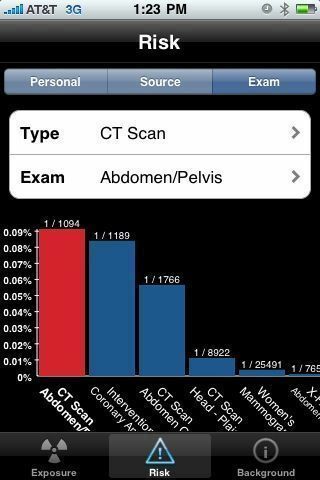 Much of the background section of the app is drawn from an accompanying article in the Journal of American College of Radiology, in which the brothers describe the application’s methodology. What is not controversial is that usage of diagnostic imaging has increased dramatically over the last two decades. For example, in the background section of the app, it quotes an article stating that the number of CT scans performed has doubled every two years since the mid 1980s. Another quoted article (Brenner and Hall, 2007) apparently claims that up to 1.5-2% of ALL cancers in the US may become attributable to radiation from CT scans alone, if current usage rates continue. These numbers make it clear that mitigating this risk is an increasingly important goal for patients and physicians alike. The application has two main functions. One is a straightforward “calculator” of radiation exposure. Studies are sorted into categories such as “cardiology”, “dental”, “GI”, “CT”, etc. The other is a personal repository of cumulative radiation exposure. The application takes into account the age of the patient and the age at the time of radiation exposure. This is important since radiation induced cancers usually take many years to develop and therefore, exposure at young age is considered higher risk than later in life. The app automatically enters the average amount of radiation exposure for each type of study (in milli-Sieverts), although this default can be overridden. 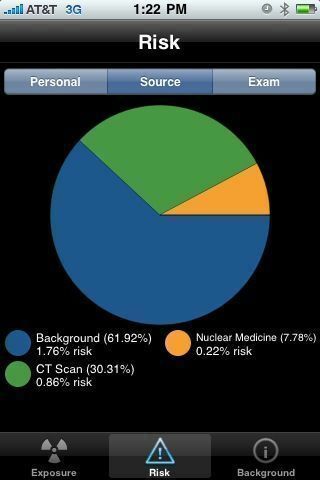 Once the studies have been entered, the app displays a pie chart of the different modalities’ contribution to cumulative lifetime radiation exposure and cancer risk. It is interesting to see that background earth radiation is actually a large proportion to the cumulative dose, that is until one gets a few CT scans under the belt ! Radiation Passport is a very well thought-out application that addresses an important need. It is well documented and comes at a time of increasing attention to the cancer risk of diagnostic imaging by physicians and patients. In order to achieve its potential the application interface should be streamlined and the confusing use of medical jargon mitigated to allow for better usage by lay persons. Tidal Pool Software (www.tidalpool.ca), the makers of Radiation Passport, has announced a partnership with Clario Imaging to integrate their dose and risk cumulative logging functions directly into Clario zVision radiology and picture archiving information system (RIS/PACS). This will be helpful for physicians to inform them, at the point of order entry, the cumulative dose and risk for their patients. This is fascinating information. As always, it is so remarkable what science can do to improve healthcare and spread awareness!